Social TV, or social interaction related to program content, is an unavoidable phenomenon. Just ask anybody who has innocently logged onto Facebook or casually perused Twitter only to be confronted with the latest plot twist from the most recent episode of their favorite show--which was saved on their DVR and they were planning to enjoy it later. While it can be incredibly disappointing--although apps have recently been created to save us from Twitter spoilers--it's clear that we really like to talk about our favorite programming, and we're holding these conversations where we talk about everything else: on social networks. After engaging with a show on social media, viewers were 75 percent more apt to watch that show (via live broadcast, online stream or reruns). Viewers who have "followed" or "liked" a TV show are 27 percent more likely to download related mobile apps. Thirty percent of respondents play show-related social media games on a weekly basis. Thirty-six percent of survey respondents use social media to access exclusive show video content. The data highlighted in Viacom's study further proves that there is tremendous opportunity for second screen content. 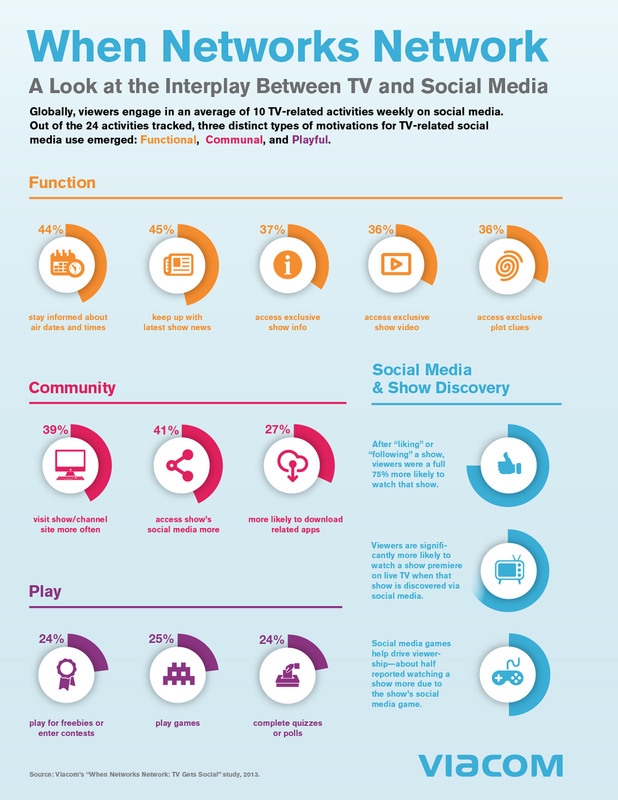 Consumers have a voracious appetite for social TV, and particularly for exclusive video content and apps. Broadcasters are acting innovatively when it comes to the second screen experience from both a content engagement and an advertising perspective. And, presumably, there's only more creativity to come. How do you tap social networks to augment your TV viewing experience? Let us know in the comments.